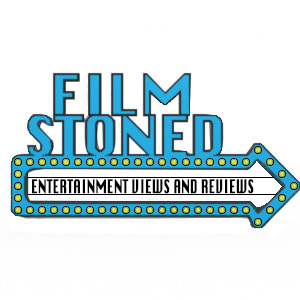 When I went into the movie theater in my Quentin Tarantino t-shirt and anti-nazi jacket, I was putting together an apology for writing a non-perfect review for a film by a man whom I consider to be one of the absolute masters of modern cinema. Because, it goes without saying that a movie with mixed reviews from Cannes like this cannot be perfect. How absolutely stunned and delighted I was to find that both I, and several other film critics, had been wrong. The opening titles were typical of a Tarantino film, with a distinct 70s feel so prominent in his previous work. The title of the first chapter of the opus, “Once Upon a Time in Nazi Occupied France”, brought a knowledgeable laugh from some of the more film-savvy members of the audience, which was perhaps not fitting with the general mood of the opening scene. After this, however, the ride was a flawless one. Right off the bat, we have an extended dialogue scene, one in which seemingly inane small-talk is spoken by masterfully picked, and very genuine actors. While in Pulp Fiction, however, such a scene merely lead up to a more threatening one, this extended dialogue was merely concealing an artfully intense undercurrent, as we are revealed the true intent of the characters, and their positions. The play with various languages used by the characters does not come off as gimmicky. Instead, international misunderstanding is masterfully used as a source of tension throughout the film, as a way of keeping characters without knowledge of the language painfully in the dark until a climactic moment. 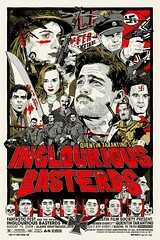 Overall, the eponymous basterds are not given nearly the screen time one would think. This may come as a surprise when one considers how synonymous Tarantino’s name had become with Americana. This, however, is a stroke of absolute brilliance, managing to bring a War World II movie into a modern context, one in which Americans are no longer viewed solely as saviors of Europe. Indeed, the basterds’ role in the final act is near redundant, and their attempts at foreign language are hilarious. This, however, does not detract from the undeniable swagger of the characters. Regardless what else one might say about him, Brad Pitt’s Lt. Aldo Raine is an absolute master of one-liners. One could say that he is a sort of import into this very European film, along with his tribe of nazi-hunters. The true residents of the Tarantino-verse being dropped behind enemy lines in Nazi-occupied France to wreak havoc, which is something they are good at no matter how bad they may be at Italian. Eli Roth’s character of ‘the bear Jew” is executed with a chilling amount of pleasure, which is both undeniably fitting for the character, and not very surprising when it comes from the director of the infamous Hostel. Probably the most common hypothetical use for a time machine is gunning down Hitler, and this man does it in the blazing glory of fury that the Jewish character – scratch that, the entire world – deserves. The surprising self-denial of Americana is also understandable considering that the films that have inspired Tarantino’s often exaggerated estimations of American life come from European masters of cinema, such as Sergio Leone. In this light, Lt. Raine’s bumbling attempts at Italian are revealing, particularly when one considers the fact that his character often acts directly as a voice for Tarantino himself. The other nazi with any true depth is Fredrick Zoller, played by Daniel Brühl. This war hero, starring in a film about his own war escapades, is torn between his successful career as a nazi, and his humanity. The conflict comes to the head in a climax between him and a Jewish woman whom he desperately loves, and who only shows the slightest hint of affection for him after his demise. This finally brings us to probably the truest protagonist of the film – Shosanna Dreyfus, “the face of Jewish vengeance”, played masterfully by Melanie Laurent. A strong female lead in a Tarantino film obviously does not surprise anyone, but her absolute determination in both staying alive and all-consuming vengeance, as well as her stunning beauty far surpasses the samurai-sword wielding assassin from the Kill Bill movies. The actress superbly performs scenes in which she has to pretend to appear calm, when the audience knows the character is anything but – such as when she has to converse calmly with the killer of her family. Her final message to the nazis is that of gleeful victory by one victim over the forces which have swept Europe up in a blazing storm of fire, and so does she end it in a similar way. The scene in which she readies herself for the finale and applies her feminine war paint is awe-inspiring. This is also true of other camerawork in the film. It reveals an incredible sentimentality, while not being silly or probing for a few cheap tears. The soundtrack, similarly, while being borrowed from film classics (there are a few very recognizable Ennio Morricone pieces), is not a gimmicky. It works perfectly to create a mood in a way that may have been impossible with a modern composer. The last line of the film is “This may be my masterpiece.” Mr. Tarantino, you ain’t lyin. So here’s the interesting thing about Killing Them Softly – it’s possibly the most intellectually demanding gangster film ever made. It certainly doesn’t take a genius-level political analyst to understand that the movie is about something other than the basic plot, as what seems like every scene has the tv or radio on in the background, littering the movie with references to politicians, and cementing it in the time leading up immediately to the 2008 presidential election in the United States. Many an audience member, however, may be at a loss as to what, precisely, the film is getting at. The film revolves around the robbery of an illegal poker game, by a few men that think they will never be caught. The act sends the local illegal market into a screeching halt, as everyone becomes afraid to do business. In steps Brad Pitt, an unnamed enforcer who’s first act is simply and publicly disposing of the obvious perpetrator in the interest of appeasing the public. After this, he sets out to find and punish the true perpetrators, Vincent Curatola the mastermind, Ben Mendelsohn the junkie, and Scott McNairy, who’s not too bright, but a nice guy at heart. This retribution for their crimes against the established criminal order is precise, though not without setbacks – mostly in the form of inept employees, as most obviously personified by James Gandolfini – a hitman who, once sharp, has turned to alcohol and prostitutes, and is quickly disposed of by Pitt once he recognizes that. The metaphor, which may actually be more obvious in synopsis than it was on the screen, best comes through in the relationship of Pitt’s character with Richard Jenkins, the representative of the “corporate model” of the organized crime in the city. The two hold regular meetings, mostly in cars, and while Jenkins has many reservations about the enforcer’s mode of operations, he ultimately lets the only man who seemingly knows what he’s doing take the reigns. In a final monologue, however, it is revealed that the market and the well-being of the organization he represents is the furthest thing from Pitt’s character’s mind, explaining that “America is business. Now [expletive deleted] pay me.” This, of course, is meant to represent the general cynicism of the financial institutions and the politicians in the aftermath of the economic crash. All this is not very profound and could be seen as a very perfunctory analysis of the causes for the current economic climate. The value of the movie is, however, in the strength of it’s parable in illustrating, through the world of organized crime, today’s political realities. If nothing else, viewing onset of the crisis through this prism is a valuable thought experiment. Do not be mislead into believing, based on the preceding description, that the film is dry, however. The movie is extremely visceral and bold at times, director Andrew Dominik alternating between concealing moments of brutality from the audience and showing every detail – from multiple angles, even. Even on the most basic level, it works as a thriller, if a somewhat oddly pedagogic and deliberately paced one.